During the month of October, PIKS presented its newest project “UPSHIFT KMUNA”. This project is a synergy of the Kosovo Model United Nations Academy – KMUNA and the UPSHIFT project of the UNICEF Innovations Lab Kosovo. UPSHIFT KMUNA – “Global Goals, Local Impact” is a Social Impact Workshop which prepares selected youth from across 15 municipalities of Kosovo to identify, analyze, and take entrepreneurial action against challenges in their communities—helping young people realize their role as agents of social change, and building their leadership skills, professional readiness, and resilience along the way. This initiative was powered by the kind support of UNICEF Innovations Lab Kosovo, IPKO Foundation and a U.S. Embassy Pristina, Kosovo. The opinions and conclusions expressed in this blogpost are of PIKS NGO and do not necessarily reflect those of our partners mentioned above. Throughout the first cycles of UPSHIFT KMUNA, our team traveled in four corners of Kosovo and presented the project through info-sessions to the potential youngsters that would compete with their identified problems and potential solutions. We received 19 applications of teams composed of 2-4 individuals each. Ultimately, 10 teams were shortlisted to take part in the workshop to be held from 14-16 October in the suburbs of Prishtina. The teams joined us for three intense days of getting into the roots of community problems, generating out-of-this-world solutions, and then iterating, iterating, and more iterating in order to get to the most pragmatic, yet innovative, solutions! “I profoundly believe that every youngster has the potential to become a changemaker. Youngsters are full of energy, enthusiasm, and innovative ideas. They live here, they know the issues and they’re perfectly able to come up with creative solutions. We just need to give them space and the opportunity, and we are doing just that with UPSHIFT KMUNA which provides for such a chance and I feel fortunate to be able to help these changemakers a little as they initiate their solutions for local issues”. Ultimately, after the extremely intense 72 hours, the ten teams present, pitched their ideas to the professional jury; with five of them being selected as the best! The five teams of young champs, with the help of their mentors, shaped their ideas into tangible, impactful projects to be implemented in the upcoming three months with the support of our partners at UNICEF Innovations Lab Kosovo. The winning ideas intend to tackle these social issues : a) Sexual harassment in schools in Mitrovica, b) Improve inter-ethnic relations among youth in Kamenica c) Bullying in schools in Lipjan d) Defy gender stereotypes among youngsters in Gjakova, and e) Provide more after-school activities for youngsters in Junik. We sent a vibrant standing ovation to all the 10 participating teams for their hard work, dedication, tenacity and change-maker spirit! 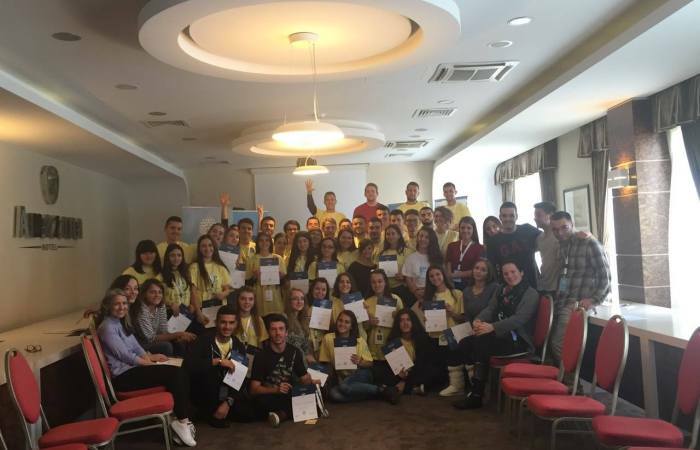 Our team – here at PIKS – is confident that these are the people who will lead Kosovo to a brighter future!